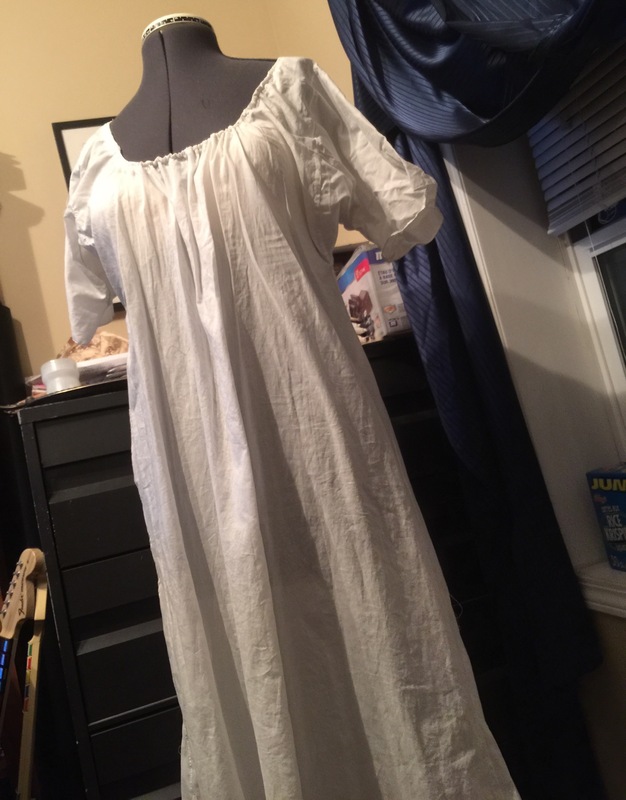 I didn’t really follow the chemise pattern, partly because I only printed half of it, but mostly because I prefer a gored construction method, and I’m pretty sure it’s still historically accurate. 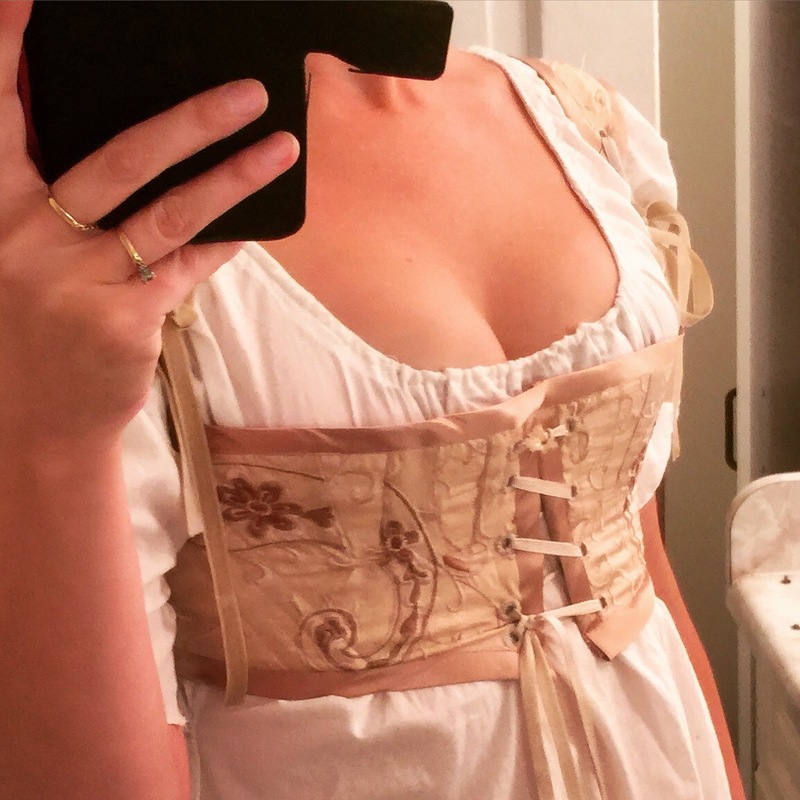 I did copy the neckline, but otherwise I used the same two-gored construction I did for my Victorian chemise. In hind-sight, I wish I’d done the single, asymmetrical gore (more “old fashioned”) but I forgot at the time. Apparently I need to make another. 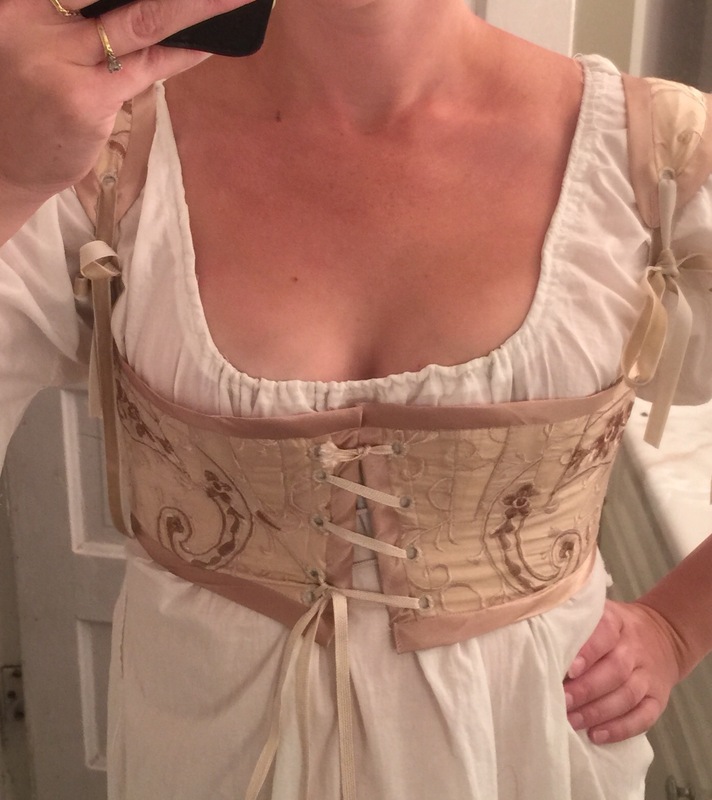 Because I really need another historical chemise. >_< Add rectangular bits for sleeves and the last couple of square scraps for gussets. 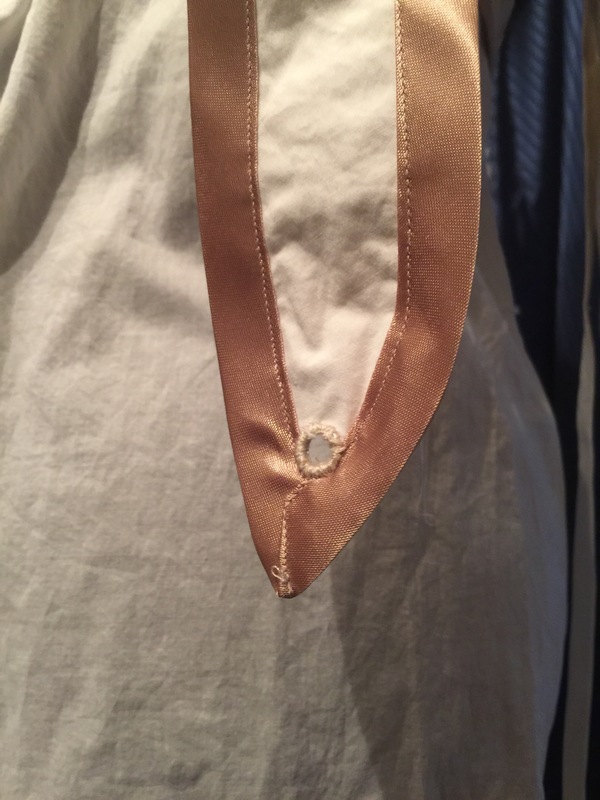 I made hand-worked eyelets for the neckline drawstring to pass through. However, not being overly bright, I worked them in the BACK of the neckline. Oops. 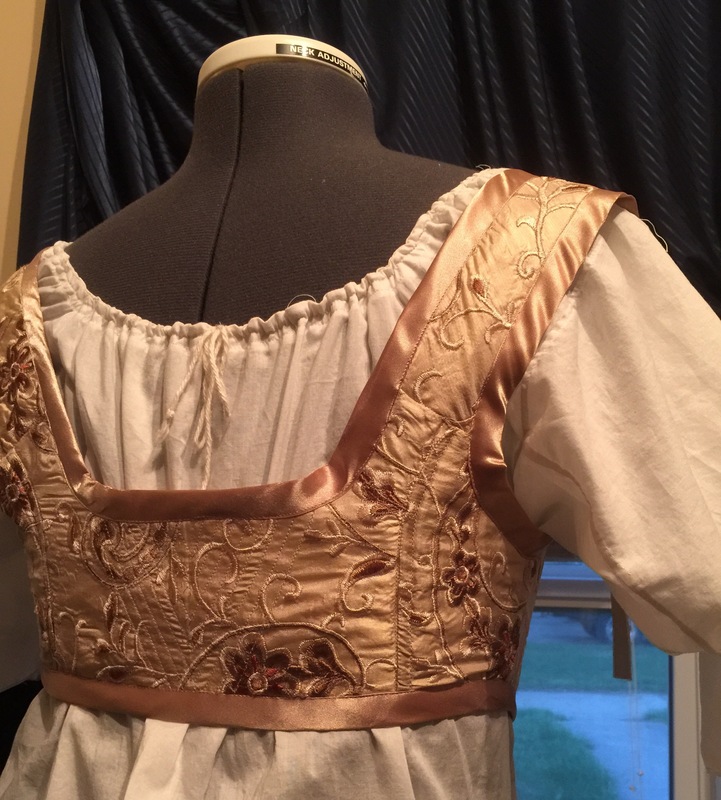 I’m not really happy with the neckline anyway (I did a fairly terrible job of applying the bias tape drawstring casing) and it seems a little high so when/if I get the time and inclination Imay redo it. The short-stays were more fun, and slightly less of a comedy of errors. 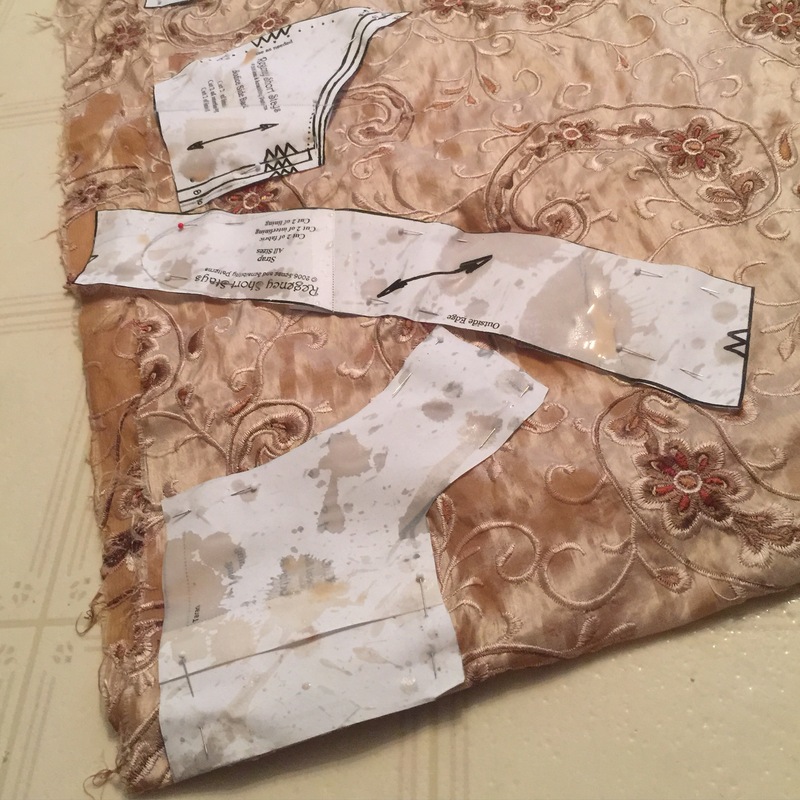 Aside from the part where I dumped an entire cup of coffee on the pattern and fabric. We won’t speak further on that. At leas the silk is pretty coffee coloured to begin with. Speaking of which, I added some quilting to the back, which is completely unboned, for a wee bit more support. It looks nice, anyway. 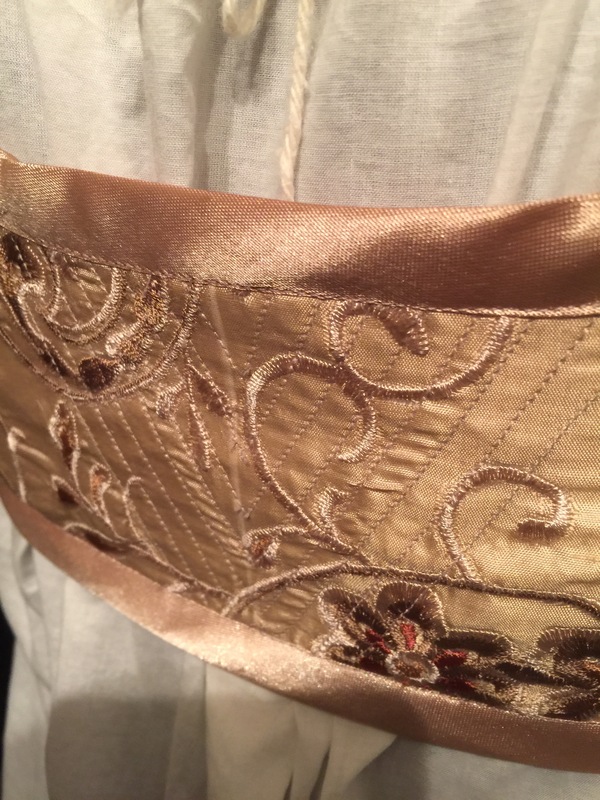 I wanted a coordinating silk in a solid to make my bias binding (the idea of trying to make a binding out of my embroidered silk was a bit horrifying) but there was naught to be had. So I threw authenticity out the window* and went with a very modern polyester satin bias trim, which was both fast and easy and a great colour. Front. My dressform does not squish as well as I do. I made my eyelets by hand, as per period (and not nearly as many as that damn mediaeval dress, as I reminded myself constantly) but reinforced with metal jump rings. Although I’m not sure how often this was actually done, (I did read about it, though, somewhere) it was fun to try out and the resulting eyelets are nicely circular and sturdy. Eyelet inside, with jump ring. 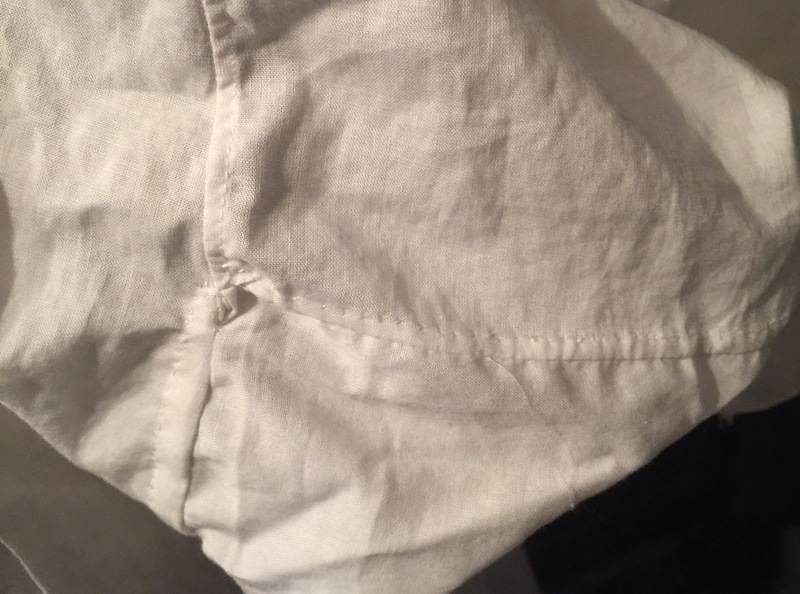 The bottom of the stays is designed to have a drawstring to hold them down. I left the channel open but haven’t tried to thread it—my rib cage doesn’t exactly taper downwards, so I’m not convinced it would help with anything. I cut a size 12 (same sizing as big 4 patterns, as far as I can tell, how nice), with the B-cup gussets. I optimistically auditioned the C-cup versions but, ah, no. I also cut down to a size 10 in circumference, though I didn’t mess with any of the vertical measurements. 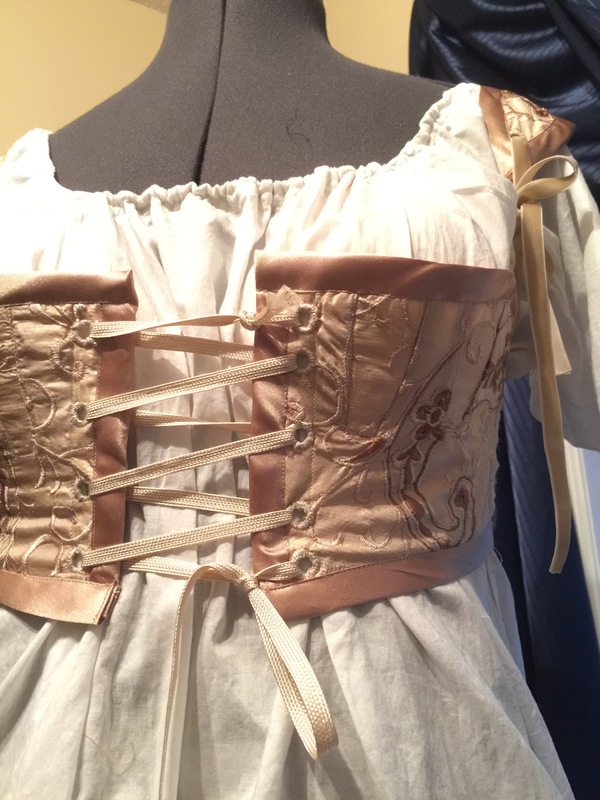 The only actual change I made to the pattern was to have the straps separate in the front and attach with ties. Not so much because I thought there was anything wrong with the pattern length but just in case, y’know. Plus I had this fabulous matching velvet ribbon. I think I set them a little further apart than the original pattern would call for—this isn’t inappropriate for the period but would probably be too wide for a lot of people (including my dress form.) They seem to stay fairy well on me, though—though I haven’t tested them under heavy movement yet. It was a pretty darn fun project, anyway, however ridiculously impractical. And quick. And now I can think about a Regency gown for Hallowe’en. 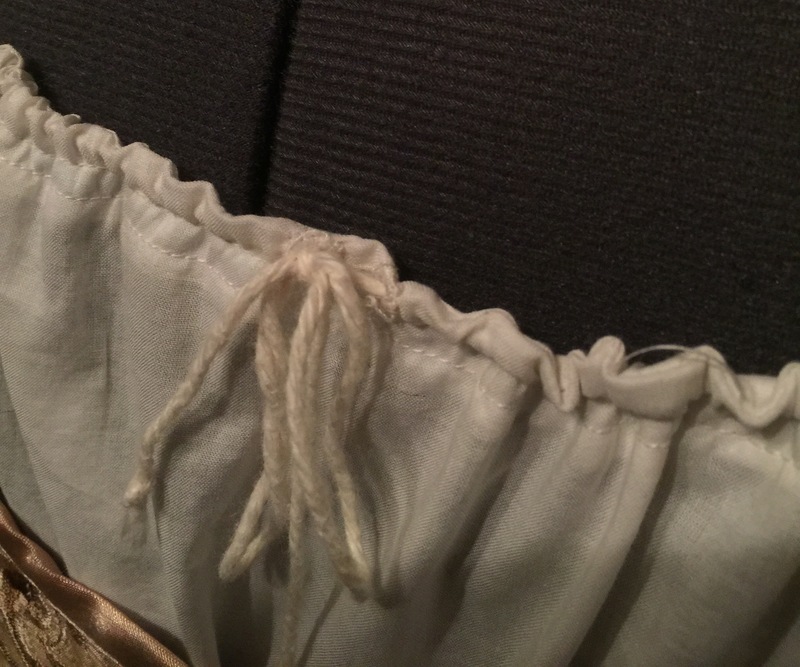 *if there was anything left to throw out after I chose my embroidered silk; I haven’t been able to find anything in period even remotely as ornate as my silk. Love it! My first thought was Wench! Beautiful work,,,and that silk is luxurious. Knickers for women first made their appearance around this time, because of the penchant for semi-transparent gowns, that were then wetted down to cling to the body … a girl had to preserve SOME mystery. I just love this set. 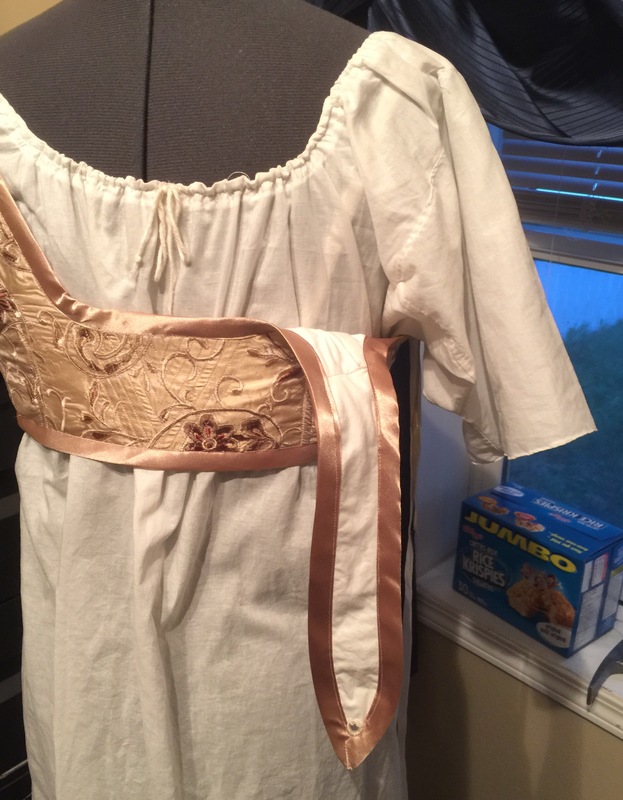 You should totally make a dress for Halloween so they get an outing! 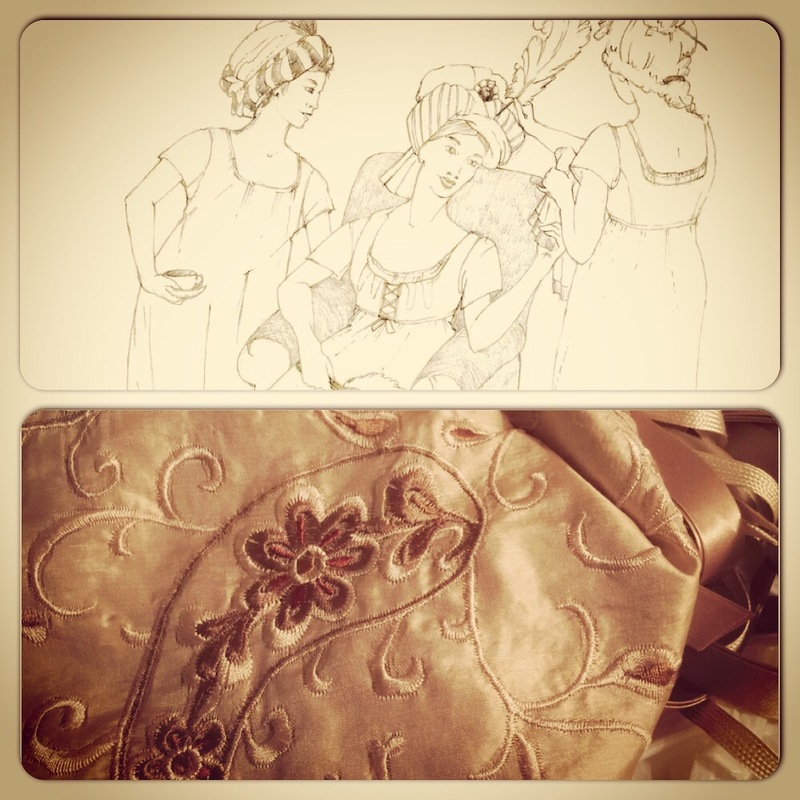 It might seem impractical, but today I was told by a friend that sewing is a form of art! Those eyelets are impressive! And the underoos are flirty, and demure – I think it looks like a fun thing to wear. Nice work on the short stay – beautiful fabric, and nice handiwork. Nice cleavage! What a fun stays project. Was there a particular sized jump ring used? I think I want to do this on my Ren Faire costume. I haven’t even worn it yet, and the grommets keep popping off. Cheap things. I’d rather just work some lacing holes by hand. They were larger ones, maybe 7 or 8 mm? About the size of the grommets you want to use would work fine. 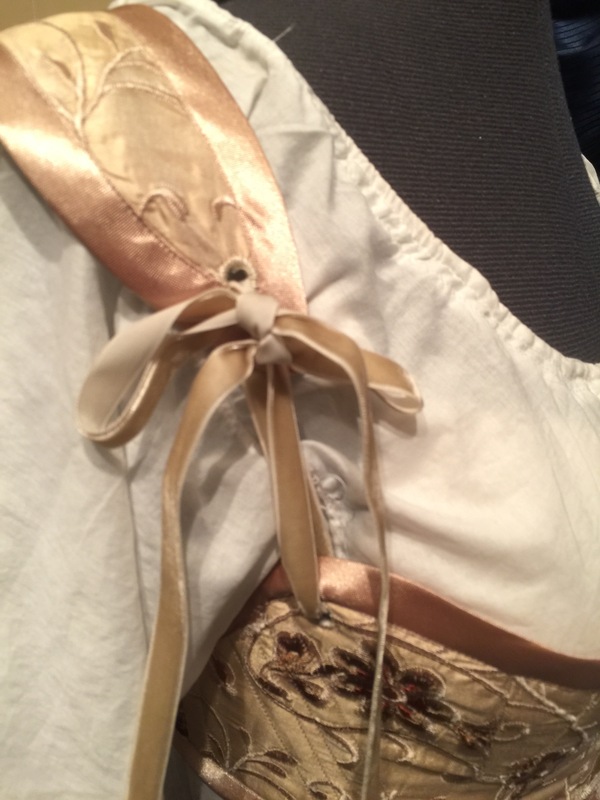 I made the same ensamble two years ago thinking the same thing: a regency costume for halloween! But never got the nerve to tackle the dress….maybe this year! Love your fabric!